Ingenico?s next generation iCT220 terminal combines the power of dual ARM9 and ARM7 processors, the latest PCI PED 3.x security, and the revenue opportunities of countless value added services. Engineered to last, the compact design eliminates technical complexity to assure faultless operation in even the most demanding of banking and retail environments, while its ergonomic styling delivers the most comfortable and convenient user experience of any terminal in its class. 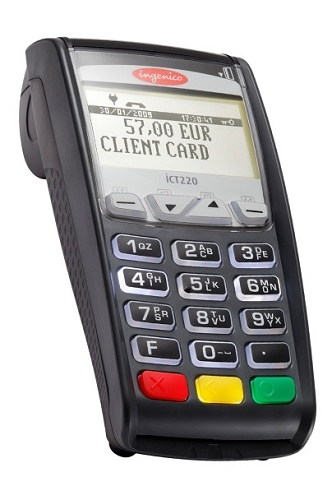 The new Ingenico iCT220 terminal is EMV level 1, level 2 and PCI PED 2.0 certified, delivering security and peace of mind for both the consumer and the merchant. Its 32-bit RISC crypto-processor provides a uniquely scalable and high-performance platform to support a host of new generation or reinforced security applications, with no impact on transaction speed or reliability. Utilizing ARM9 and ARM7 microprocessor technology, the iCT220 countertop terminal combines innovation and performance ? assuring a faster, more convenient and more reliable transaction every time. 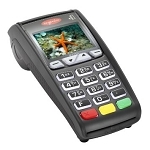 With compact design and ergonomic styling, Ingenico?s iCT220 offers a huge range of functionality. A clear backlit graphic display with high contrast white screen allows easy reading and promotion of the merchant?s brand, while the intuitively backlit designed keypad, with large keys, delivers ease of use for both merchant and consumer. Equipped with an unparalleled array of communication technologies, such as dial-up modem, Ethernet or USB, Ingenico?s iCT220 delivers any time, anywhere connectivity.